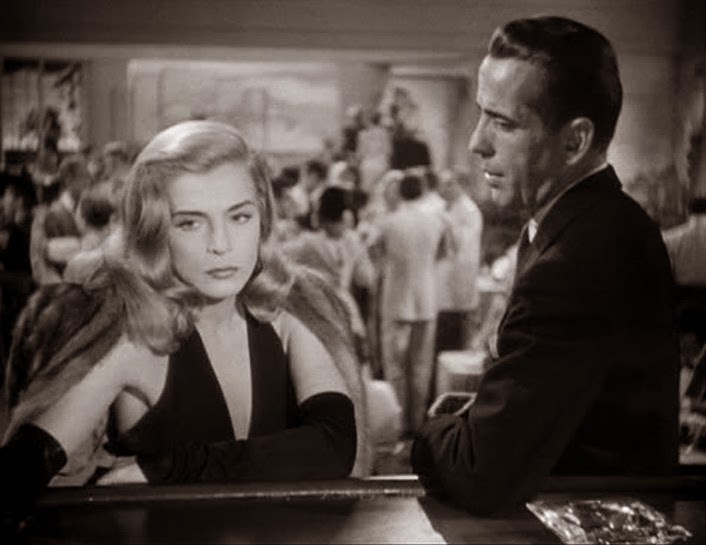 A film noir constructed out of mostly recycled content, Dead Reckoning boasts Humphrey Bogart in his prime, but otherwise suffers from a stiff female lead and a plot that convolutes to distraction. Buddies Captain "Rip" Murdock (Bogart) and Sergeant Johnny Drake (William Prince) finish their World War Two duty on a high, with both nominated for medals. But Johnny seems intent on shunning the limelight, and on the way to the Washington DC ceremonies, he abandons the train and disappears. Stunned, Rip follows his friend to his hometown of Gulf City, where he discovers that Drake's real name was Joseph Preston, and that just before the war he was accused of murdering a man called Chandler in a dispute over Chandler's wife Coral (Lizabeth Scott), a local beauty. Preston's badly charred body soon turns up at the morgue, reportedly a victim of a car crash. At a nightclub owned by shady businessman Martinelli (Morris Carnovsky), Rip tracks down bartender Louis Ord (George Chandler), who was a witness to the Chandler murder, and also meets Coral. Sparks immediately fly between Rip and Coral, although she seems eager to lose a lot of money at Martinelli's illegal casino. Before Rip can properly talk to Louis, Martinelli and his henchman Krause (Marvin Miller) interfere, framing Rip for murder, and unleashing Lieutenant Kincaid (Charles Cane) onto his tail. Rip has to extricate himself from a murder rap and untangle the web between Coral and Martinelli to try and clear the name of his wartime friend. There are a few too many borrowed elements from other Bogart movies residing within Dead Reckoning. The intentional loss at a casino is lifted straight from The Big Sleep (1946), and the determination of Bogart's character to make someone pay for the murder of his friend, no matter the personal cost, is swiped from The Maltese Falcon (1941), to the point of almost repeating the same dialogue. Lizabeth Scott herself bears a remarkable resemblance to Lauren Bacall, except that Scott lacks the silky fluidity, replacing it instead with sometimes awkward motions and bland, if husky, line delivery. But within the overall context of a derivative script, director John Cromwell does a decent job of assembling a competent and brisk film noir. Dead Reckoning hits the ground running, and maintains a determined pace that helps to overcome the shortcomings in originality. The story is told mostly in flashback, with Rip already in trouble from the first frame, bruised and on the run from the cops. He ducks into a church and finds a military chaplain, who becomes a witness to the tale. From there the other characters are quickly introduced, a typical assortment of innocent victims, slick manipulators, snarly goons, flat-footed police officers, and at the centre an alluring femme fatale who may be much more than what she seems. 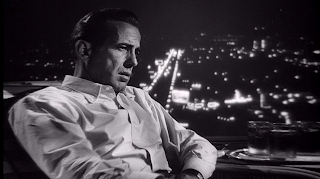 The film plugs into the energy of an engaged Bogart delivering a smooth performance. Rip Murdock is not a hard boiled private detective and lacks the indestructible snarkiness of a Sam Spade, and this vulnerability allows Bogart to play with character missteps as Rip believably falls hard for Coral's charms, and more than once gets outsmarted by Martinelli. The plot does get confusing towards the end, too many twists introduced in a stack without enough time for proper digestion, as the story rushes to lay all the blame under one bed. Dead Reckoning plays with a tired deck, but with Bogart in charge of dealing, the film still delivers a decent hand.